I had a very short trip to meet my son and his family in Hong Kong over the May day holiday. I only had time to sketch at the Changi Airport, during crowded dim sum lunch and one early morning from the hotel room in that sequence. First time I noticed while sketching the airplane that there were many activities and vehicles moving at the same time around the airplane. 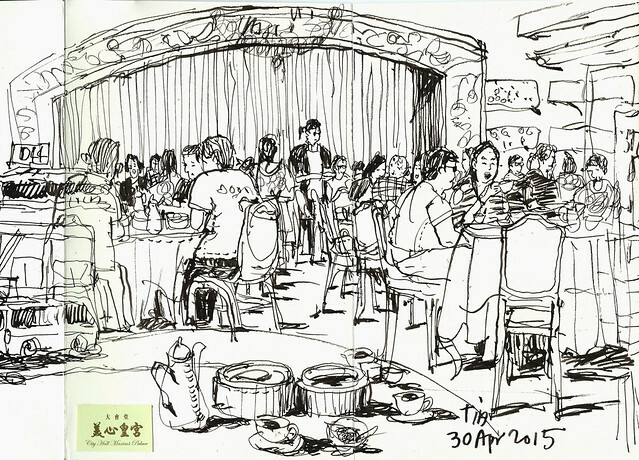 The sketch at the forever crowded Maxim's Palace had a story this time that the dim sum restaurant used the online queue system so we could stay at home and managed our time before taking a cab to the restaurant with the given online queue system. The hotel window panes at Ibis Central & Sheung Wan in Hong Kong were in ORANGE colour! What a pity with such a nice view, sigh! I picked up the light and shadow and just added some random colours here and there since everything was in ORANGE.